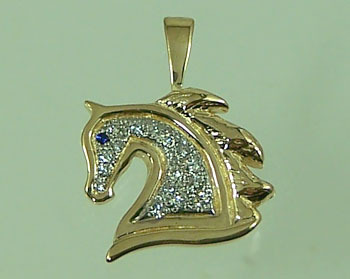 "Diamond Arabian Horse Head Pendant"
Arabian horse head pendant just full of Diamonds and a Sapphire in the eye. Would make a great gift for the Arabian horse lover in your family. Here we have a fantastic Arabian head set beautifuly with Diamonds and a Sapphire in the eye. Not a very large pendant, but full of bling! Another great design brought to you by The Gorgeous Horse. Dimensions: 5/8 inches tall x 5/8 inches wide. Available in 14kt yellow gold or 14kt white gold. Head is set with .18 carats of matching diamonds and a sapphire set in the eye. Be bold have this Arabian head set with stones that would represent your barn colors for a new excitng look! Just tell us how you would like it and our experienced staff will get to work for you. PICTURED AND PRICED HERE IN 14KT YELLOW GOLD WITH DIAMONDS AND SAPPHIRE!